Spring officially begins on Wednesday, though winter is often slow in leaving. As the earth warms up, flowers begin to peek through, inviting bees to gather pollen. Bees, of course, produce honey from floral nectar and store it in wax honeycombs within their hives. During their six-week lifespan, each worker bee produces half a teaspoon of honey. Worker bees visit over two million flowers to make one pound of honey. That’s a lot of buzzing. I’m doing research for my next novel set in Anglo-Saxon England. 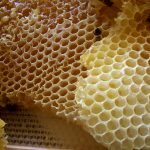 One of my nuggets of discovery is the historical importance of honey, and its many uses as an antibacterial agent. 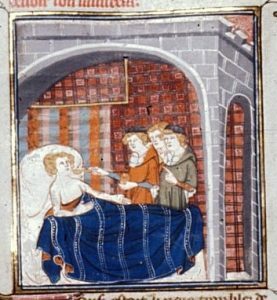 Anglo-Saxons didn’t know anything about bacteria, but they did observe honey’s beneficial effects in wound care. Early humans discovered honey as nothing short of a miracle. It’s intensely sweet and doesn’t spoil. Honey’s sweetness comes from fructose and glucose. 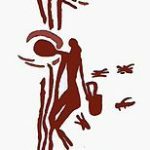 Archeologists have found traces of honey on artifacts thousands of years old — which is a significant testimony for honey’s shelf-life. 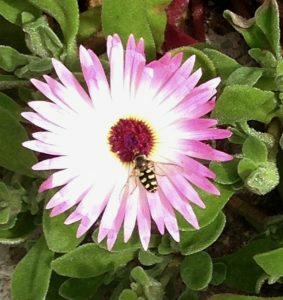 About 4,000 BCE Egyptians began keeping bees in cylinders of unbaked hardened mud pots that could be stacked in rows, and used smoke to calm the bees before harvesting their honey. Egyptians used honey as a sweetener, and an ingredient in embalming fluid. They baked honey cakes as offerings to their gods. Honey was even used as currency. In Lower Egypt, the bee was one of the symbols for Pharaoh. The Greeks kept their hives in terra cotta pots, dubbed honey as ‘nectar from the gods,’ and made their own honey cake offerings. 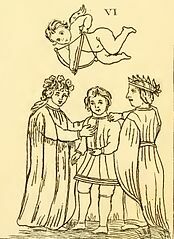 The bee is a symbol for the goddess Artemis, and Eros (more commonly known as Cupid) who dipped his arrows in honey before shooting their love potents into unsuspecting couples. Romans introduced beekeeping throughout their empire which may be how honey came to England. 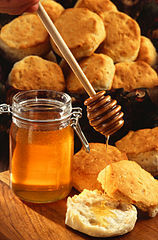 The word ‘honey’ derives from the Old English hunig. The most famous Anglo-Saxon use of honey is the brewing of mead, a drink composed primarily of honey and water with some yeast thrown in for fermentation. The libation was famously consumed in Mead Halls, such as the one visited by Beowulf. At that time, there were three types of mead. The most common mixture used empty honey combs which were steeped in water, strained, and set aside in earthen vessels until the mixture transformed into mead. The longer the mixture was left, the more potent the drink. The wealthier classes drank a type of mead called morat. This was made from actual honey, water, and mulberry juice for flavoring. A third type called pigment was made from pure honey, flavored with spices to which wine was added. This was possibly the type served to Beowulf. Medicinally, Anglo-Saxons used honey to make salves, mix into soothing drinks, and cleanse wounds. It was also a mild laxative. The Anglo-Saxons had no way of knowing honey’s qualities as an antibacterial and anti-fungal remedy, or that it naturally contains hydrogen peroxide. They only knew the results when they applied mixtures containing honey. One remedy for stomach disorders stipulated: Dig up a beet and shake off the dirt. Do not wash it. Boil in a kettle until it is cooked and thick. Add a little salt, 5 spoonfuls of honey, and 1 spoonful of oil. Have the patient drink a bowl of the mixture. The recipe gives me a new appreciation for Mary Poppins’ advice that a spoonful of sugar [or in this case, honey] makes the medicine go down. In 12th century Europe, the average person consumed four and a half pounds of honey annually. Beeswax was also in high demand for the production of candles. Beeswax has a cleaner burn than candles made from animal fat, and drops little or no ash. And did you know the origin of the term honeymoon is actually a reference to honey itself. During the Middle Ages, newlyweds drank honey wine for a full cycle of the moon to insure a fruitful union. The bride’s father supplied the wine. No doubt, after a month of drinking honey wine with her new husband, the bride found herself pregnant. After granulated white sugar became available, honey lost its premier position. By the early twentieth century, honey consumption dropped to just a half pound per person annually. Honey may not be the curative it once was, or the only source of sweetness in what was once a bland diet, but raw honey is still a good source of anti-oxidants, soothing on a sore throat, and very tasty on bread. And, as long as the lid is tightly sealed, it can be left in the cupboard indefinitely. Bee on Flower by Author. 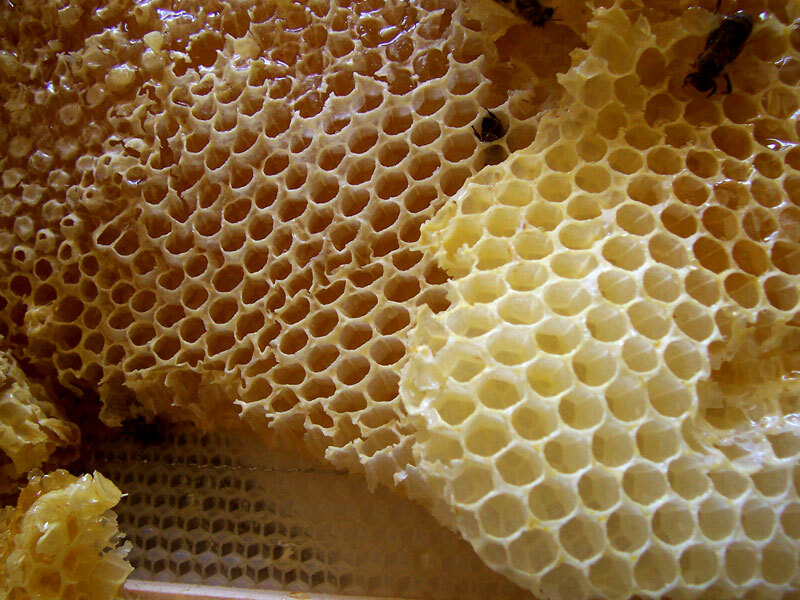 Honeycomb by Merdal at Turkish Wikipedia. 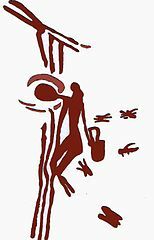 Mesolithic rock painting of honey hunter. Public Domain. 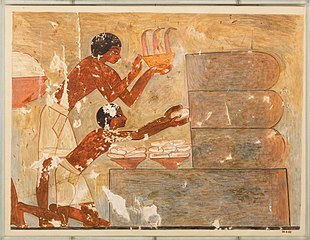 Egyptians Gathering Honey, Tomb of Rekhmire. Public Domain. Cupid in a Tarot trump card design. Public Domain. Sickbed of Louis le Gros. Public Domain. Honey on Biscuits. Public Domain. Peggy Trowbridge Filippone. “Fun Facts You Probably Don’t Know About the History of Honey. The Spruce Eats. Jan. 28, 2018. Katherine Martinko. “The Remarkable History and Healing Power of Honey.” Treehugger. Nov. 18, 2016. Joseph Nordqvist.”Everything You Need to Know About Honey.” Medical News Today. Feb. 14, 2018. I don’t know the latest update, but Albert Einstein once advised that without bees, man would only have four years to live. Something to think about. Great post, Sandra! We of course agree about the importance of bees! ps…if you ever want to put on a bee suit and come open some hives, you are welcome. Fascinating experience….